I began my journey trapped in a shuttle bus with a woman who did not believe in the beauty of silence. 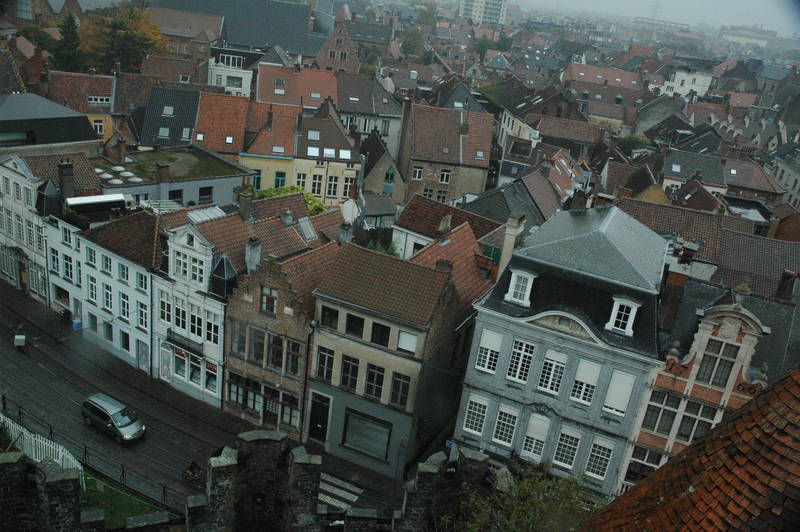 My flight to Brussels, Belgium took off at 06:05 – it was just the first of many stops. I was recovering from what could have been the flu, so striking up a conversation with the beautiful Belgian guy who sat beside me was the last thing on my to-do list. We all know that when he asked “Is this your bag?” he really meant “I love you,” right? 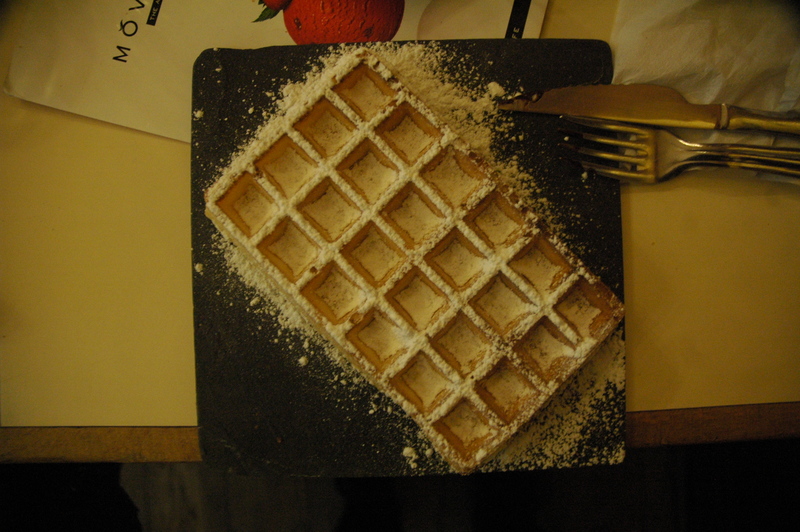 I met up with my friends Matt and Kendahl to eat Belgian waffles before we went our separate ways. 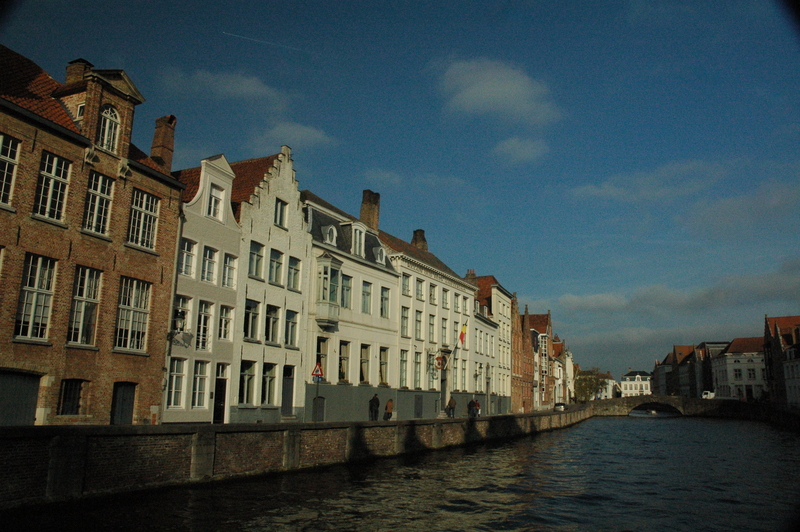 Brussels did not interest me, so I hopped on the first available train to Bruges (Brugge). Luckily I found an awesome web deal which allowed me to take trains in Belgium for only €6 (1.850Ft/$7.49) per ticket instead of paying the full amount which was around €14. Walking around this city was an absolute pleasure. I quickly dropped my rucksack off at my hostel (St. Christopher’s Inn – Bauhaus) and wandered around aimlessly for several hours. 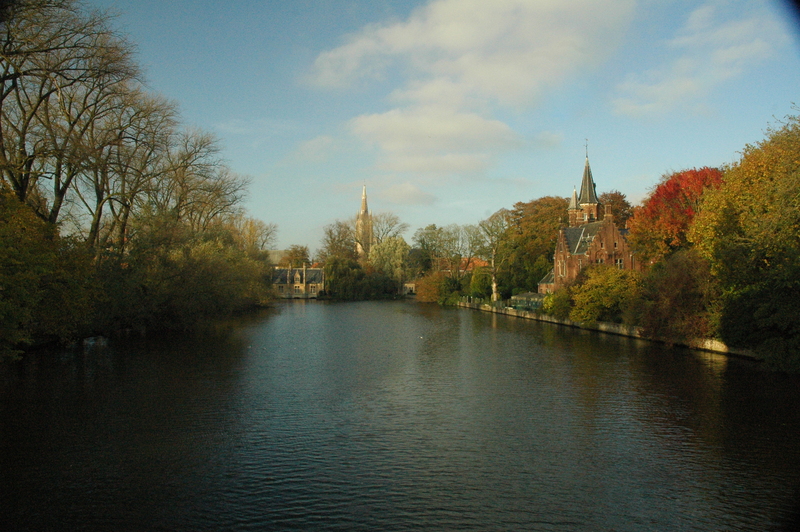 Two of my favorite sites in Bruges were the Minnewater Lake and Béguinage (Begijnhof). The trees around the lake were autumnal – vivid reds, oranges, and yellows accompanied the remaining greens. 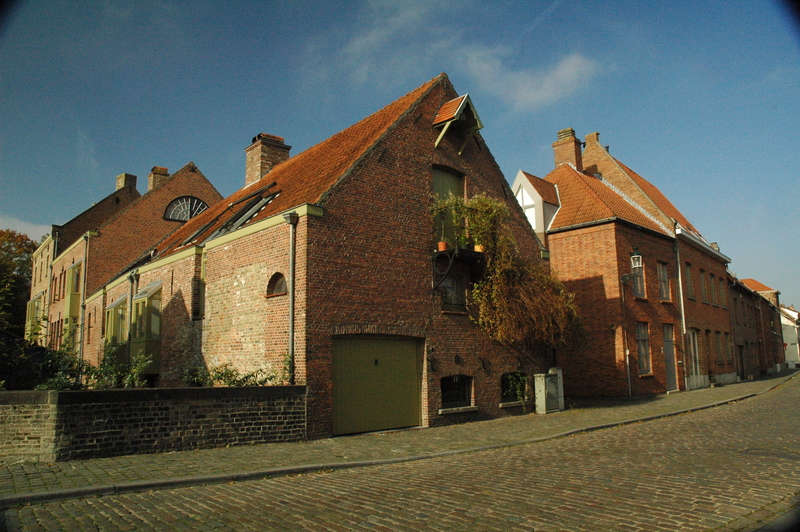 The Begijnhof, one of the most peaceful places I have ever stepped foot in, is home to roughly 25 Benedictine nuns. As I strolled around the premises, I saw one of the nuns walk into the church and was overcome with a desire to speak to her. I followed her into the church and saw several of the nuns saying their prayers together. I quietly made my exit, but accidentally bumped into the sweet nun on my way out. We apologized profusely in our native tongues then realized that we did not understand each other and laughed. The lights of the city came on at 17:51, so I spent the next hour or two popping into several shops promising “the best souvenirs.” Eventually I purchased a salad from the grocery store near my hostel and called it a night. Luckily my hostel-mates were nice enough to quietly enter and exit our room because my sickness-battling-self went to bed at 21:35. The next morning the lovely weather I experienced the day before completely vanished – depressing grey clouds made my shadow disappear all day (along with my luck). 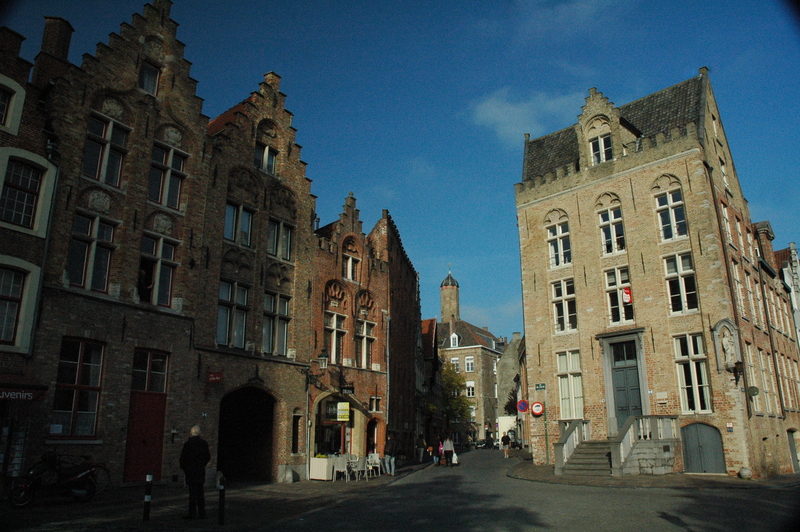 My next stop was Ghent (Gent), the capital city of the East Flanders province. Let me now explain how much I despise carrying things – I absolutely, positively abhor feeling like a pack mule. Unfortunately the sky chose to cry the only day I would have to lug my sack around for its entirety. It was also the day that I, a person with a great sense of direction, got lost – I ended up at a random art school? The pep talks I gave myself and the replay of Taylor Swift’s “Style” kept me from throwing my pack away in the closest rubbish bin. You might think that I am over-exaggerating, but I kid you not! I did not regularly carry a purse until my second year of college and almost threw away a bag in Vienna (my older sister can testify to this). I am generally in a pleasant mood, but we all have our breaking points – I get hangry (hungry + angry – ask my students) and loathe carrying excessive amounts of things for extended periods of time. The fact that my rucksack was completely drenched did not help lift my spirits. I felt like Santa Claus in a neighborhood of naughty children. 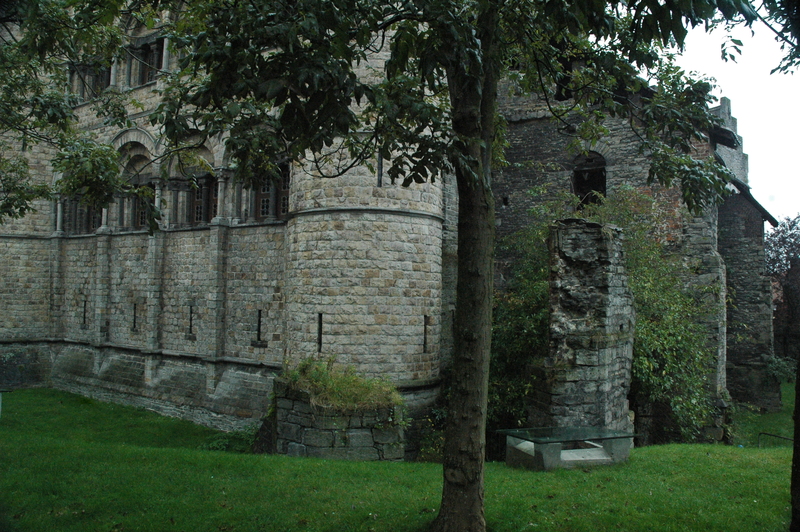 I made my way to Graveensteen, a castle built in the 12th century. It was here that I was refused my first youth discount. Apparently when you turn 26 you should be financially stable enough to be considered an “adult.” Graveensteen, I should have been considered an infant in your eyes. An attractive, young French father behind me was mistaken by the cashier to have been my husband (and his child, my son). We awkwardly denied the claims, but his son accepted my new role in his life. Every time we were in the same room together, he would smile, wave, and say lovely things in French. Many close friends know that “insta-mom-ing” is my dream – birthing a child is not something that I ever care to do. If I cannot marry into a family, I do have two friends who offered to be surrogates for me several year ago (yes, Brittany and Grace – consider your half-empty promises sealed in blood). 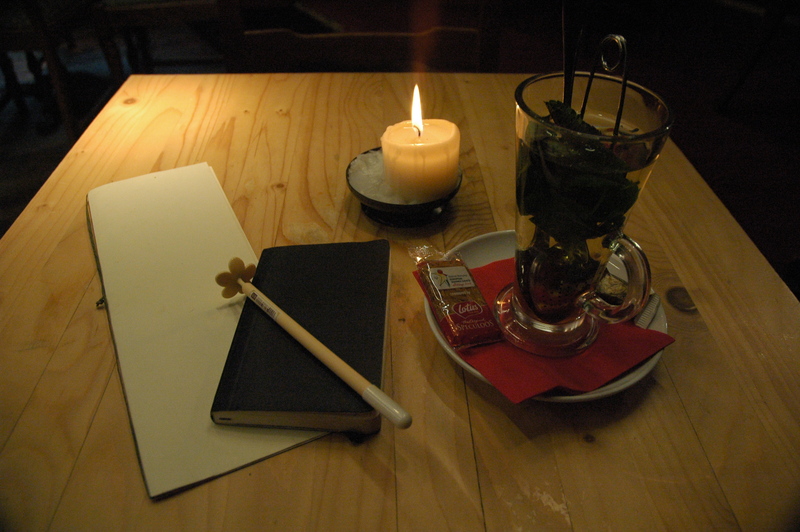 After I left the castle, I succumbed to my despair and hid in a coffee shop for two hours. I ordered a mint green tea, journaled, and creepily watched a picturesque elderly couple wine and dine. Per usual I was the only single person in a sea of couples. 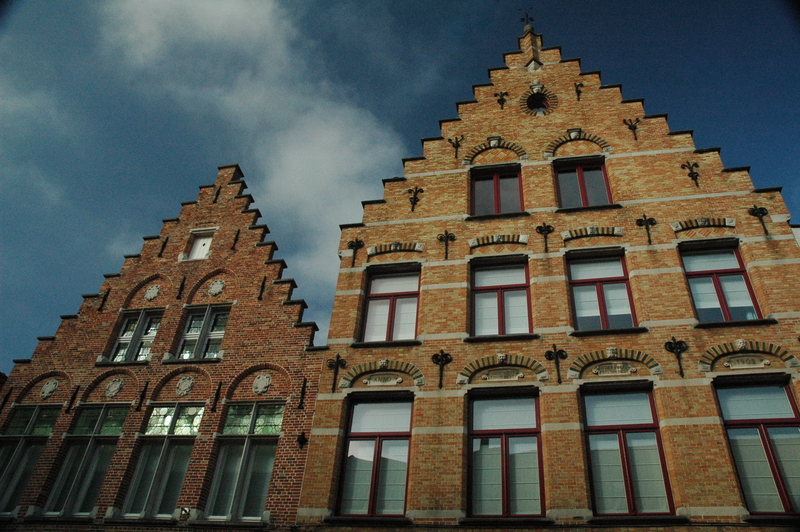 I booked a place on a Megabus to take me from Ghent to Rotterdam, Netherlands, so I eventually made my way to Hotel Campanile – the pickup location for the bus. For those familiar with Megabus, you know that their pick-up/drop-off locations are more likely than not in a random, distant location. I took bus 65 from Brugsepoort to Proeftuinstraat. If you want the bus to stop for you, you have to wave it down. I tried to scope out the stops on my own, but like all the signs in Ghent, the font size was a 12 at best. I eventually made friends with the driver and he let me know when to expect my stop. My Megabus experience was another thing altogether. Even though it showed up twenty or so minutes late, I was in a better mood than a few hours before. The rain had finally stopped and a flawless Spanish couple kept me company. Unfortunately our bus got stuck in a major traffic jam and put us behind two hours. I am positive that I suffer from misophonia, so the dramatic, upset man behind me who kept sucking his teeth almost made me lose it. I have different reactions to each, but the sounds that set me off the most are: the sucking of teeth, the ticking of clocks, the biting of forks (I involuntarily tense up and it takes me a while to recover), and heavy breathing in every form – sighs, snoring, etc. I finally reached Rotterdam and got on a train heading east to ‘s-Hertogenbosch where I was to be greeted by my friend Elena and her boyfriend Erik. My wonderful Dutch experience will be highlighted in my next post. In other exciting news: I BOUGHT A TICKET TO SEE ONE DIRECTION IN VIENNA (and cried after it was purchased). June 10th, 2015 will be one of the best days of my life. I even got a Harry Styles mask with the last of my money in Amsterdam to celebrate. I will be the only single, sobbing 26-year-old American wearing a Harry Styles mask in the crowd. Find me. 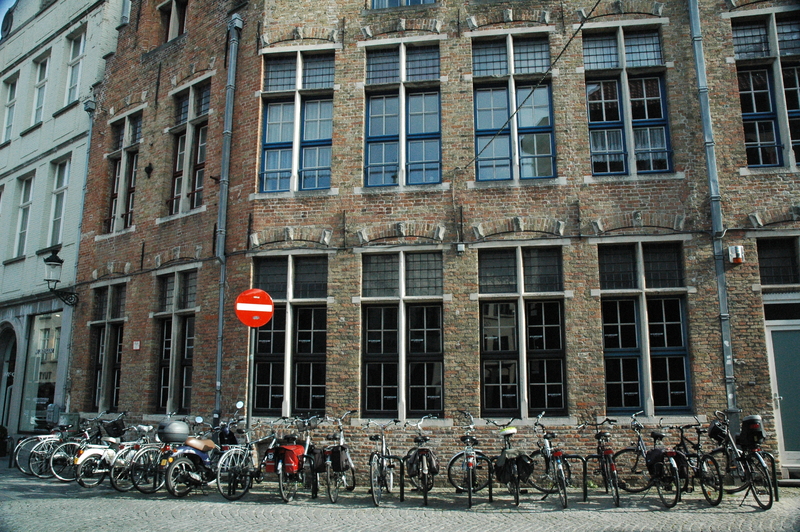 A Lesson From Miss Jennifer: Bring binoculars to Ghent because the signs are really that small. 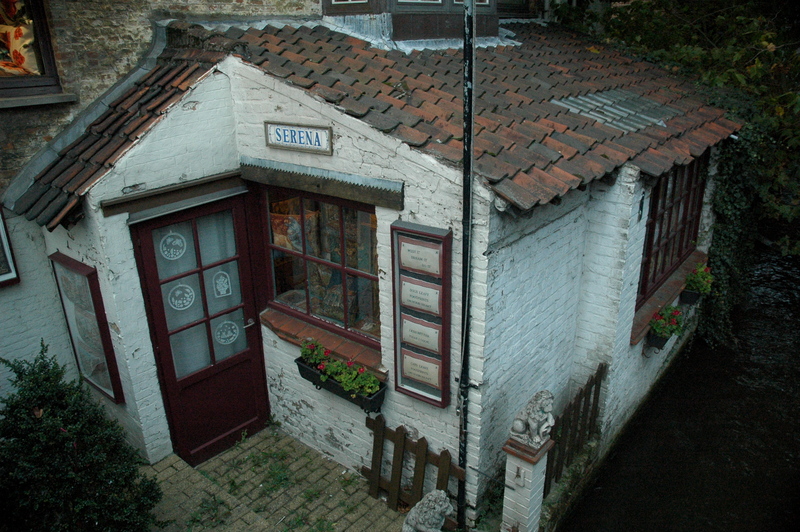 Beautiful place, small signs. Great photos. 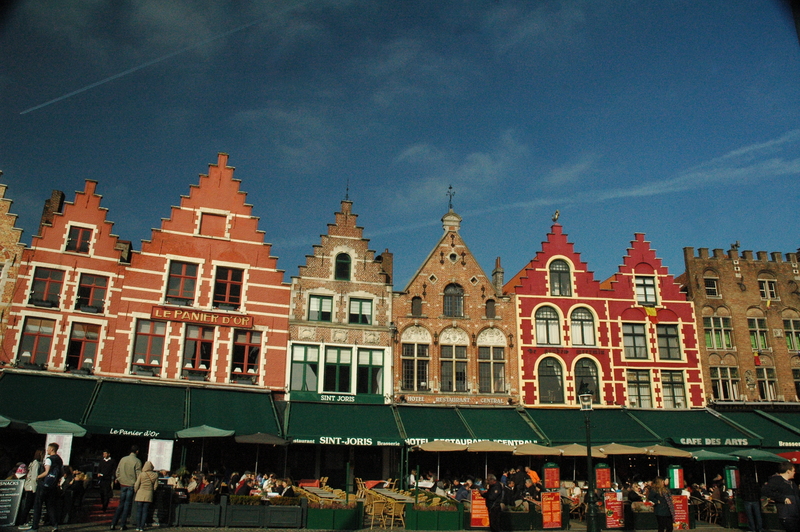 I had time for only one day trip outside of Brussels, and I chose Ghent over Bruges. Still wonder if I made the right choice, but oh well. 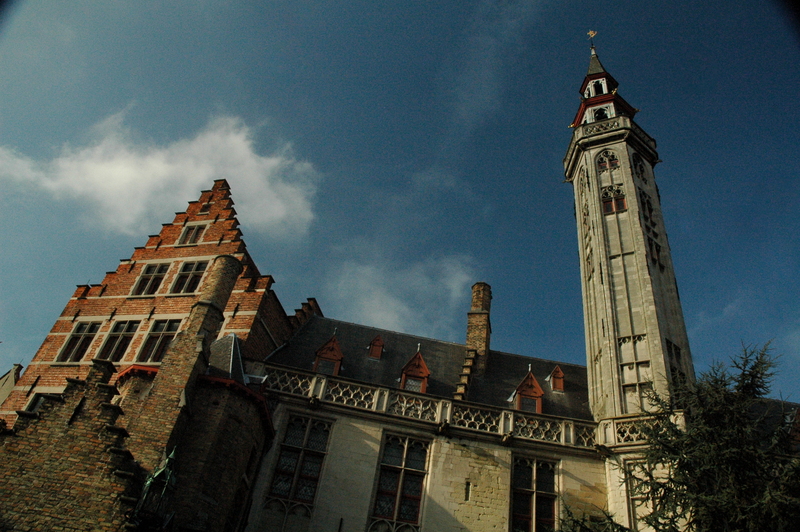 There is still time to love on Bruges! Believe and you can achieve – haha.